Heat Wave Reusable Heat Packs that will last a lifetime. Heat Wave Instant Reusable Heat Packs provide therapeutic heat therapy. Our hand warmers and heat packs are great for staying warm and pain relief. 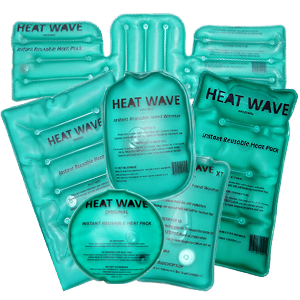 Heat Wave Instant Heat Packs are simply “heat in a click.” In a snap heat is on, it’s EZ heat, just click it hot!! Instant Hand Warmers and Instant Reusable Heat Packs work as pocket hand warmers and portable instant heat therapy. 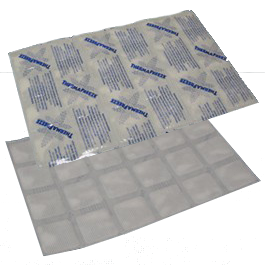 Thermafreeze Ice Pack Sheets are reusable, flexible, and easy to use. ThermaFreeze sheets are flexible even when frozen – it can be cut or folded to fit around products or in containers, or around a body part that needs cold therapy relief. The ice sheets have a thin plastic backing on one side, and soft cloth on the other to provide comfort. 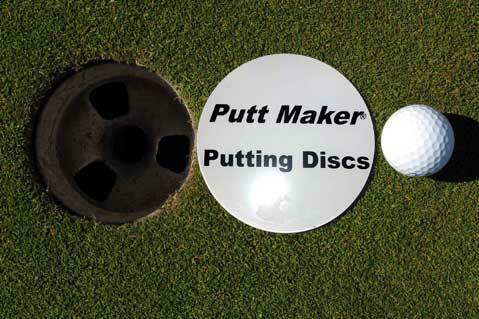 You can cut the sheet to size, or fold them to fit your needs. Thermafreeze can be used in coolers or lunch bags, as a cold therapy or ice pack for pain relief, or even to store and ship cold or frozen items. Ice Wraptor Ice Wraps make you and your ice packs mobile. 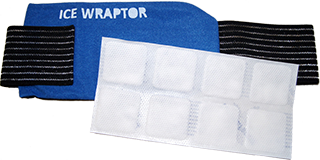 Ice Wraptor Ice Wraps with ThermaFreeze Ice Pack Sheets make you and your ice packs mobile, by letting you wear them for extended periods of time, offering cold therapy relief for sore backs, knees, small joints, or bruises and sprains.